I don't know about you, but when I'm full of mental cobwebs, my creativity flies out the window. Instead of making anything new, I spent the last couple of days building my gift tags stash, using recently ordered stamps. It was very therapeutic. Today, mental balance has returned (phew!) and I'm in a 'better give than receive' mood. 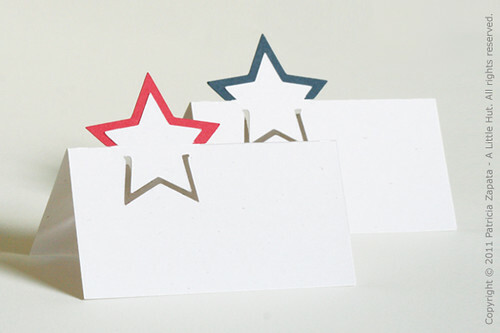 Seeing so many 4th of July projects has seeped through, so I worked on this simple place card project that you can either cut by hand or with a cutting machine. It's a new freebie for you! If you don't celebrate the 4th of July, you can still use the cards to help decorate any occasion for the stars that brighten your life. I called them place cards but they can also be used as gift tags or food labels (I've also heard them called food tents—right?). 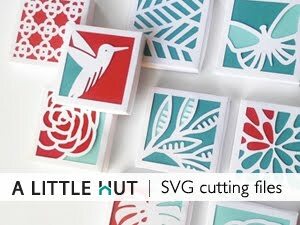 Download files here (PDF, SVG & DXF files are included).